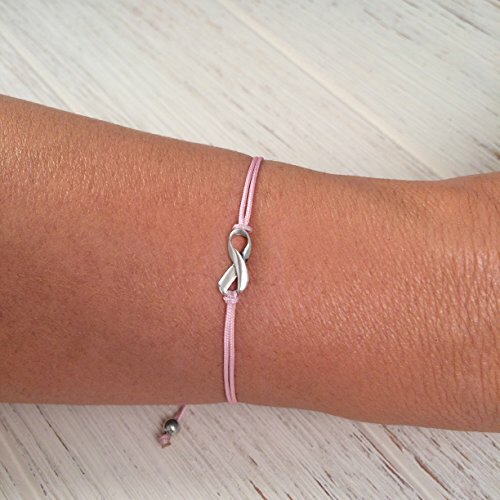 This one-of-a-kind HANDMADE charm thread bracelet is a small, but symbolic way to express your support during Breast Cancer Awareness Month in October or National Cancer Survivors Day. Shop on AmazonSmile for this meaningful gift. Also available in White, Blue, Black, Orange, Red, Grey, Lime, Green, Teal, Purple, and Lavender. CLAUDIA LIRA is a talented and recognized jewelry designer from Lima, Peru. At Claudia Lira Joyas you will find a selection of high quality, impeccable finish, handmade rings, necklaces, pendants, bracelets, and earrings all crafted in high quality 925 Sterling Silver. Claudia Lira transforms silver into sophisticated, contemporary designs. Make a statement with unique simple designs - every day! Modern everyday jewelry designed and handmade in Peru. HOW TO CARE FOR STERLING SILVER JEWELRY: Proper care includes being conscious of how you store, wear, and clean your jewelry. Do not allow your Sterling Silver jewelry to come into contact with harsh household chemicals such as bleach, ammonia, or chlorine. To avoid scratches and dents, store silver in a lined jewelry bag/pouch; in an area with low humidity as it is prone to naturally tarnish. If you notice any discoloration, we recommend use a gentle polish made specifically for removing tarnish. Also, try cleaning and wearing silver jewelry regularly to help maintain your Sterling Silver jewelry looking brilliant for years to come. If you have any questions about this product by Claudia Lira Joyas, contact us by completing and submitting the form below. If you are looking for a specif part number, please include it with your message.